Progressive activist Ben Chin will enter his second runoff in two years for the mayor's office. LEWISTON, Maine — Progressive activist Ben Chin outpolled four others in the race to succeed term-limited Lewiston Mayor Robert Macdonald on Tuesday, but he couldn’t avoid a dangerous runoff election in December against conservative City Councilor Shane Bouchard. 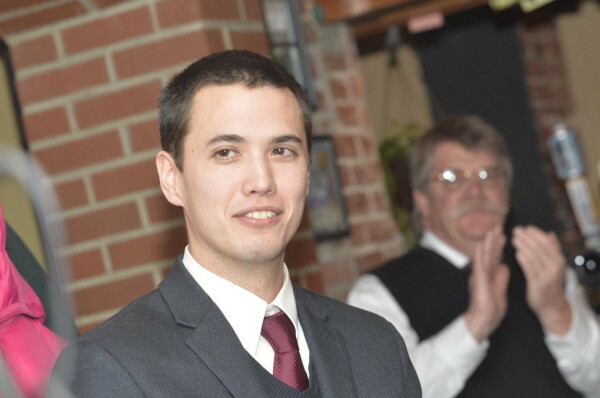 Chin, a Bates College graduate, enters his second mayoral runoff in two years. He also beat the field in the November 2015 election, but Macdonald overtook him in a runoff that gained national attention to win a third term and Bouchard could beat him the same way that the mayor did. The 32-year-old Democrat and organizer for the progressive Maine People’s Alliance got 42 percent of votes in Tuesday’s election for the nonpartisan office in Maine second-largest city. Bouchard, a 37-year-old landscaping company owner and Republican, got 29 percent of votes. Bouchard said his campaign presented “clear positions” to voters and suggested that Chin may have hit somewhat of a ceiling in Tuesday’s first election, like he did in 2015 against Macdonald. He said Chin ran a better campaign this year, but hinted that he’s too radical for Lewiston. Former City Council President Mark Cayer finished in third place with 24 percent of votes, ahead of former Auburn city councilor Ron Potvin at 4 percent and perennial candidate Charles Soule, who got just over a percent in what he said was his eighth and final mayoral run. The race may be similar to 2015, but Lewiston’s race this year was far lower-key than the one between Chin and Macdonald amid the rise of President Donald Trump in a city that is heavily Democratic by voter registration, but has voted for Republicans amid concerns about welfare. Macdonald, a conservative, famously said in 2012 that Somali immigrants who have settled in the region by the thousands since the early 2000s should “ leave your culture at the door.” After beating Chin, he told Breitbart News that he thought Trump’s political rise helped him. Chin came back in 2017 with a bold set of proposed progressive policies, including a $30 million fund to help developers renovate rental properties, a local pharmacy licensing system aimed at fighting the opioid crisis and a city job corps to employ people and make local improvements. Bouchard countered Chin’s chief constituency at Bates by saying at an October debate that out-of-state students “shouldn’t be voting in our local elections.” He also said that Bates Mill #5, a landmark building and part of a stalled private development plan, should be demolished. Both Chin and Bouchard opposed the Lewiston-Auburn merger that failed to pass Tuesday on both sides of the Androscoggin River and dominated political conversations in both cities. Their runoff will be on Dec. 12, according to City Clerk Kathy Montejo. After she voted Tuesday at Longley Elementary School, Vanessa Stassi, a 41-year-old interpreter, said she backed Chin for his sweeping vision for the city. “We’re not friends, but I’ve had conversations with him and it’s always really striking how the blend of smartness and kindness just seem really well-balanced,” she said.